FRANKLINTON—District Attorney Warren Montgomery’s Office held two daylong training sessions for criminal justice system professionals on Nov. 6 and Nov. 8 at the Bogue Chitto State Conference Center. This year, the sixth annual event was named the Lewis Murray, III, Memorial Training For Law Enforcement, Prosecutors, And Judges in memory of the late Assistant District Attorney who worked as a prosecutor for more than 33 years and headed the Washington Parish office until his death in April. 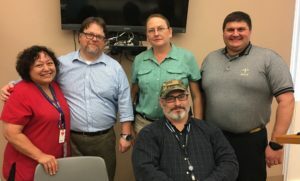 The training, held in partnership with the Louisiana District Attorney’s Association, enabled participants to get Continuing Legal Education credits. A total of 110 law enforcement officers attended over both days. The agencies represented included the Louisiana State Park Rangers, Causeway Police, Franklinton Police Department, Bogalusa Police Department, Folsom Police Department, St. Tammany Parish Sheriff’s Office, Washington Parish Sheriff’s Office, ATF, and District Attorney’s Office. Assistant District Attorneys Jason Cuccia, David Weilbaecher, and Jeffrey Shea Penton provided legal updates about state legislative changes this year, particularly concerning juvenile laws. Tommie Sorrell, an investigator with the District Attorney’s Office, discussed the basics of investigations from writing a report to appearing in court. Cuccia also did a presentation about the evolving laws, concerning search and seizure. Susan Johannsen, District Forensic Coordinator for the State of Louisiana, discussed mental illness, what happens when a person is experiencing withdrawal symptoms from substance abuse, and the risks to the offender and service provider. Penton closed the session with a discussion about cyber crime, the dark side of the internet, and Crypto Currency. The free training, which began at 8 a.m. and ended at 4:30 p.m., was open to anyone employed in the criminal justice system, but it was specifically geared toward law enforcement, prosecutors, and judges. 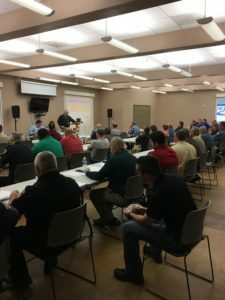 Image on Left – Law enforcement officers from around the region attended the sixth annual Lewis Murray, III, Law Enforcement Training For Law Enforcement, Prosecutors, and Judges, sponsored by District Attorney Warren Montgomery’s Office. Image in Midde -The presenters for the Lewis Murray, III, Law Enforcement Training, sponsored by District Attorney Warren Montgomery’s Office, were (l to r): Susan Johannsen , District Forensic Coordinator for the State of Louisiana; Assistant District Attorney Shea Penton, Investigator Tommie Sorrell, Assistant District Attorney Jason Cuccia, and (seated) Assistant District Attorney David Weilbaecher, Jr.